On the last day of February this past week, among the warmest we’ve experienced so far, Aurelia and I heard both peepers and woodcocks for the first time in the year, around dusk. The peepers were only active down in the bottom, distinct though pretty far off; but the woodcocks with their “peent!” calls and the twitchy, liquid chirp of their mating flights were all around us at the edges of the village in the lowering twilight. It is an evening I keep an ear out for every year around this time, and it seems to satisfy that part of me seeking reassurance that the seasons will in fact turn once again. That it coincided with the full moon was just icing on the cake. Ted bringing you this week’s news from Dancing Rabbit. 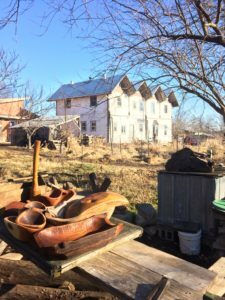 With the temperatures slowly climbing, Sara and I have been spending a lot more time outdoors, pruning fruit trees, clearing last year’s growth from garden beds and preparing them for planting this spring. Sara has also amended some remaining potting soil from last season to compare with a couple varieties of purchased organic potting soil, and having received our new garden seed in the mail last week, we’re ready to sprout some new friends! The higher temperatures also mean the maples are in full flower, which means the end of maple sugaring time. The final syrup firing over at Sandhill is due early this week. Steadily warmer winters in recent years have meant shorter, more erratic sugaring opportunities, but the result is no less sweet. One of my favorite treats, usually on my birthday each February, is just to drink the sap straight, with the silky light sweetness that makes me think I’m likely to grow a few inches after drinking it. Maybe that’s just the suggestive influence of the Lord of the Rings in my mind. Speaking of trees with minds of their own, I have lately uncovered a shameful example of my own negligence related to a tree in front of our house that is proving difficult to remedy. For years while we were building various structures, I used one or more woven poly tarps to underlay various piles of sand, gravel, and etc., allowing them to be fully cleaned up after, once used. In recent years we haven’t been doing much construction of that sort, and apparently after I cleaned up the last pile, I folded a large tarp and laid it “temporarily” against the base of a volunteer silver maple just south of the house until I needed it again. Perhaps it got covered when leaves fell, or by the particulate accumulation of lots of firewood processing, but I lost track of it until I uncovered it again recently. In the meantime, the tree has grown significantly in girth and apparently thought the moisture trapped in the layers of tarp was sufficient enticement to send out a generous root system to take advantage of it. To my horror and fascination, the tree has literally eaten the tarp, with the weave disappearing over and over directly into the flesh of the tree’s roots. I’ve spent a couple hours with various implements from shovel to box knife trying to extract it, and made very little progress. The tree wasn’t even officially invited to live in this spot, mind you, it is just the result of a failure to keep it cut because I have a soft spot for trees; and because my child and her friends like to hang out like a troop of monkeys up in its various heights with some regularity. Woven poly tarps can be among the worst of plastic pollution. They deteriorate over a year or two into a million tiny striped shreds blowing away in the wind to find their way into our local soil ecosystem, inserting their unnatural elements into the food chain. Even here in an ecovillage, perhaps especially here where we try to get maximum possible use of the resources passing through our midst, this plastic waste proliferates. I’m fairly sure the right answer for me is to stop using such tarps at all, knowing what they inevitably become and the way the oceans and land alike are drowning in plastics in many places. China stopped accepting most recyclables from abroad January 1 after serving as the primary destination for such things from the developed world for decades, so our plastic troubles seem likely to get a lot more visible in the near future. Maybe that is a needed thing, a prod to help all of us witness the cost of our plastic addiction a little closer to home, make each of us think twice before accepting yet another plastic bag at the grocery store instead of bringing a sturdier reusable one with. And yet these tarps also help preserve lots of other materials until we are ready to use them. What is the best replacement? Do I just build more durable infrastructure? Just do without? Probably both of these and more. At any rate, I’ve learned not to turn my back on an adolescent tree for too long. 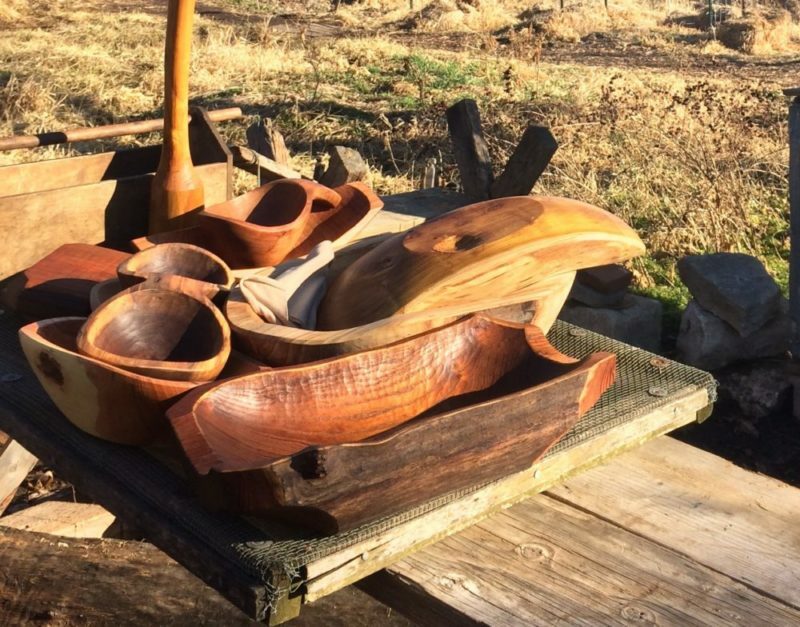 Freshly-oiled bowls and other creations drying in the sun. These were hand-carved by Thomas, one of the amazing instructors of our Timber Frame Workshop. Photo by Caleb. Thomas had a small show Friday of finished bowls, stools, and other lovely items hand-hewn and carved from local woods of all descriptions. Usually this artisan can tell you not just the species of tree it came from, but also some of the usually complicated story of where it had been growing, why and how it came down, and how it was extracted from there. I still happily recall the time about 12 of us and Donkey hauled a giant black walnut log a quarter mile from the near edge of Red Earth back to the village via the road under Thomas’s direction. That brings me to some of Sunday’s excitement here, which was a Village Council meeting focused in part on establishing official names for our various village roads, pursuant to the county’s 911 addressing efforts. Our paths and ways have developed names with various levels of intentionality over the years, and often they’ve had more than one name each. Without sufficient time to employ our usual decision-making processes, it was both thrilling and disconcerting to rush through the variety of decision points with only the voices present. Now to erect actual street signs and numbers, and for me to settle in to living on Redwing Turn! Maybe the most electrifying event of the week, though, was the arrival of a group purchase of 72 new 270-watt solar panels early in the week. A group of villagers helped receive them, inspecting each to verify it had not been damaged in shipping, and then stowed them safely in a sheltered storage area until they can be deployed and start contributing to our village power grid. Three cheers for a little more greening of our local grid! With the blustery drizzle and rain here today I feel like I’ve been swept off to the Orkneys in the North Sea, but ultimately it is just another sign of spring rolling in. Here’s to the start of another cycle of green; may your seeds sprouts strong and true in the coming weeks. Two jobs ago, I worked at a place that had a lot of World War 2 surplus tarps that were made of out some sort of heavy fabric. They did fine in sunlight (ultraviolet is rough on those cheap blue tarps, and on many other plastics), but had to be stored dry, and in a dry location, or they would rot. They were far heavier than the plastic ones, though. There’s also the stuff that “grass sacks” are made out of. Jute? A coarse weave fabric that’s tan in color. Another that comes to mind is muslin, an off-white heavy fabric. Hey Ted thanks for the update. It’s always a joy to read your writing and this was a particularly good piece. Thomas’s bowls are beautiful.